Sapphire art retreat is a unique art camp set in the Central Queensland gemfields, where you can experience living and creating art on the working sapphire mine, ‘Windeyers Folly’. Stay in renovated retro art caravans for a fun, glamping experience. There will be a mix of teacher interaction and free time to create on this camp. You are welcome to bring your mediums of choice. A drawing/sketching journal and travel kit with watercolours, pen, pencil and brushes will be given to you on arrival. Experienced artist and tutor, Maria Paterson (B.A.visual arts, Dip Ed), is on hand to share with you techniques, skills and knowledge to help encourage and improve your drawing and painting practice. For the camp in June we will have a visiting guest artist, Phillipa Howell, who is an experienced art facilitator. Phillipa holds a BA Visual Arts(painting) GradDip Fine Art (VCA), MA Fine Art(Arts Therapy)and a Associate Dip in the Arts(Music). Phillipa will run a few sessions on letting go of self doubt and adopt a playful approach to exploring possibilities of line, colour shape and images in order to free up the creative process and help us to get in touch with our inner vision. There will be field excursions exploring the surrounding environment and a chance to sketch or plein air paint, while a delicious picnic lunch will be served up. There is a huge shed on the claim converted into living and studio space and its cabinets of curiosities will provide us with many opportunities for still life subjects. The visiting bird life provides us with natural models and entertaining antics. A high tea in the shed, where you can meet the local gem field miners and craftspeople, always an informative experience. There will be an opportunity to have a fossick and lunch at Pats Gems. Learning about the gem trade from miner to goldsmiths from gemmologist Patricia Windeyer( FGA) the owner of the Folly. At night we will fire up the campfire with good conversation and do some gazing at the Milkyway. 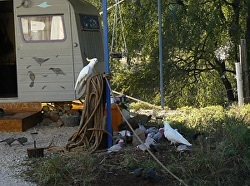 Accommodation is provided in newly renovated retro art caravans. These vans have been fitted out with beds and a study area and are themed in interesting ways. There are four vans - two singles and two shared vans outside the shed and one other inside the shed. There are limited places available at the camp. Central to the caravans is the Taj Mahal of sheds which contains facilities to lounge and relax in, a kitchen and dining area a with pot belly stove, and a renovated bathroom. All meals will be catered for by excellent local cooks, except for one evening when we will dine out. Website: http://www.mariapaterson.com. See events page for details. Sapphire Art Retreat will be held on the 2nd of July to the 9th of July, book now for July camp, there are limited places.